Nothing in last week and I didn’t spend as long this week as I’d usually do. Here they are. THE UNIVERSITY OF MIDDLESEX HAS SUGGESTED ROBOTS COULD HELP SOLVE THE ELDERLY SOCIAL CARE CRISIS. DOCTORS ARE WORRIED WE COULD SEE THE QUICK RETURN OF THE ‘BLUE SCREEN OF DEATH’. UK AGREES £100M TURKEY DEFENCE DEAL. FUNDING RUNS OUT DECEMBER 24TH. 7 COUNTRIES ARE ON THE US BAN LIST. RUMOURS OF PLANS ON ADDING 4 MORE DENIED AS TRUMP WOULD HAVE TO TAKE OFF HIS SOCKS TO COUNT THEM. NUMBER: ONE MILLION FIVE HUNDRED-THOUSAND PETITION TO CANCEL STATE VISIT BY TRUMP. NUMBER TEN IGNORES PETITION. 10: CELEBRITIES WHO ARE NOW TREES, NUMBER 7 WILL SHOCK YOU. 6%: FINE DEUTSCHE BANK PAID AFTER ADMITTING $10 BILLION RUSSIAN MONEY LAUNDERING SCHEME. 94%: PROFIT THAT PROVES THAT CRIME DOES PAY. I wrote the first 2 Breaking News while investigating stories for sketches. BN1 was a bit of a struggle wording it but I was mainly happy with it. BN2 was just very silly – I just hope the Turkey/turkey wordplay is obvious and appreciated by people in the Newsjack writers room. 14 Years in Prison: What a ‘man on the street’ would receive as punishement if they were involved in Money Laundering. That didn’t read right so I re-worked it to be the joke I submitted. I guess I’ll find out Thursday how I did. Falcons on a plane! 80 of them! Intro: With the Petition and March against Donald Trump’s visit to the UK, Theresa May is desperate to show strong leadership at a time when she is being called into question so she contacts her polical allies to see if they can help. Theresa: Does anyone have any hand santisiter? He touched my hand. Boris: Cripes! Just be glad that’s ALL he touched. Amber: So what are we going to do about this petition? Over 1 million people have requested we stop his state visit. Theresa: We can’t do that! It would be signalling that we bow to any popullist gesture. Amber: But didn’t we do just that in calling for the referendum? And then again when we won it? Theresa: No, that was completely different. Brexit means Brexit, I’ve been very clear on that. Amber: So what do we tell people? He has that golf course up in Scotland, maybe you can ask Nicola if she can help? Theresa: Och-Aye the Noo to you too, Nicola. I need a favour. Nicola: You only call me on my cell phone..
Nicola: When you need my Love…..
Theresa: (confused) Donald is coming over to the UK and I need you to take him out and show him the town up in Scotchlandshire. Nicola: Really? He gets a little handsy. By that I mean he likes touching with his tiny wee hands. And by that I mean his hands are tiny and also covered in …. Theresa: (interupting) I understand. Now can you distract him with windfarms or something. Nicola: Of course. But I will need a favour from you? Theresa: (frustrating) What do you want? Nicola: A second scottinsh referendum! Nicola: You may take our land but you’ll never take our FREEEEEDOM! Theresa: So Nicola is no help. Anyone got any other ideas? Boris: Well Chaps, I can think of someone who could help us here. He has been out of the lime-light for a while and I know him and Trump get on like a house on fire. Let me go get him. Nigel: I’m just a normal bloke like you. I like pubs, fags and beer. And not Foreigners. Boris: What-Ho Nigel! Bozza needs a favour. As the Foreign Secretary I need you to handle Trump and have him re-arrange his trip to the UK. Nigel: I’m just a normal bloke like him. I like walls, no healthcare and definitely denying climate change. Let me give him a call and see what I can do. Trump: I’m like the greatest on the phone. Trump: See, I knew that. I’m on the phone now. No-one has been better on the phone than me. Nigel: Don, its Nige. I’m just a normal bloke like you. Trump: Nigel. I knew that! You are speaking to The Donald. That’s me, by the way. Nigel: The Donald. I need to come visit you. Trump: Excellent. I’m the best at being visited. But now is bad, so very bad. Its like the worst time to visit me as I’ll be in the United Kingdom of England and my scotish golf course. Nigel: So I’ve heard, but I’m not sure you are aware of something. Trump: The Donald is aware of everything. I’m like the president of being aware. No-one is more aware of things than me. Nigel: Then you would have heard that ….errr…the uk is currently being over-run by …eerrrrrr…. Sylvanian Families. Trump: Of course I had. Sylvanian Families. Coming over there and radicalising your kids! Nigel: I know. Parents all over the countries are being asked to PAY to get more of them into their homes. Trump: You should build a wall! Nigel: Anyway, I just don’t think it is safe for the Donald at the moment. Trump: The Donald might be affected? Nigel: The Donald’s kids might be affected. Trump: That makes The Donald sad. And no-one is more sadder than the Donald. Nigel: So you’ll stay there and I’ll come visit you? Trump: Sure! Other people have said they will stay, but The Donald will deliver on his commitment to stay here. Nigel: Thanks The Donald. See you soon. FX – Phone hang up. Trump: I have arrived! I’m the best at arriving. No-one is better arriving than me. Nigel: Errr…The Donald. I thought I was visiting you. Trump: You are. Me being here is just an Alternative Fact.Its sure is cold in the UK. The Donald is oh so cold. I’m like the best at being cold. Can anyone make my gloves smaller so they fit on my hands? Probably best you wash them first. Scientist #1: So there we have it. The next big health craze. Scientist #2: People will be amazed! Scientist #3: No longer will people talk about cute babies with chubby little faces. Scientist #2: That’s right. They will soon learn that babies should have ripped physiques. Scientist #3: My life long plan is complete. It started with teaching babies how to roller-skate for that Evian advert and now this – Baby Fitbit. Scientist #1: How will we convince suckers, I mean ‘parents’ that a happy baby is a baby with 10000+ followers on Instagram? Scientist #2: Let’s ask the best subject, Tarquin, who has been trialling the Baby Fitbit out in the real world tests of nursery groups and ball pits. Scientist #1: Excellent work their Tarquin. We can certainly upload your activity stats to an Instagram page for hundreds of other babies to review and aspire to be you. Scientist #2: And we can also log all your nappy changes with length of wear, speediness of change but most importantly consistency of content. Scientist #3: We’ve even worked out how you can challenge your friends to a nappy competition to see who can fill theirs the quickest or the fullest or even speed of changing so you can prove your parents are better that theirs. Scientist #1: Let’s get some videos on your Facebook page of you looking over the sea at a sunset, while at a beach. We will need to have the tracker in shot as our sponsors have asked it be tweeted about. Scientist #2: Quick! I’ve just been contacted by Pampers. They will pay £5000 if we can Instagram a pic of Tarquin wearing their brand. Scientist #3: I’ve got some stuffing to pad-out the front a bit…. Scientist #1: No need, it sounds like he has managed to do that all by himself. As threatened last week, I decided to try to write some sketches for this week’s NewsJack. Its a hard one as I’ve mentioned before that to keep them topical they need to be written Monday Morning and submitted by Lunchtime. 3 hours tops and it can’t interfere with my day job. The format of the Sketches have changed a nd there is no-longer any ‘adverts’ (although I suppose there is nothing to stop you submitting an advert as a sketch if you wanted). The curren format is that you can supply 2 sketches and so that is what I did. Here is the link to the sketches rather than have them on here. I actually wrote Baby Fitbit first. A news story on the BBC mentioned it and it really did seem a stupid thing so perfect for lampooning in a sketch. I don’t have much of an idea where sketches will go when I write them but this one seemed to flow naturally. I liked it, but am not 100% convinced with the ending. Having listened to a few sketches on NewsJack I think they don’t all have ‘good’ endings but they do all end so I’m not going to worry about it. The Donald Trump Petition sketch was a disaster of a sketch. It came off seeing the phrase ‘Popularist Gesture’ from the Government in response to the petition which had gone over the 1 million mark. Its seemed like most of what is happening in the UK at the moment is due to a ‘Popularist Gesture’ so I wanted to write about that. I had 25 minutes before the deadline. I had no idea where the sketch was going or how it would end but I just wrote until I ended up somewhere. I didn’t include any jokes about piss. Well maybe I did, and I really liked the Nicola joke. Made it all worth-while to me! I did think this sketch went on too long but I timed it and it was about 2 minutes. Luckily last week I did a bit of anaylsis of what was broadcast so I could see that 2 minutes wasn’t too longer for a broadcasted sketch. I’d not like to do much longer for a sketch as most were lest than 2 minutes. I still find writing sketches hard. I’m like the worst at writing sketches. But I will keep doing it. I wonder if I should try to write more/differently. With only NewsJack to ‘quality control’ (either it is good and it is in the show or it is rubbish and it isn’t) I have no idea on how to improve. I have got 2 one-liners from the research I did this morning so it hasn’t all been a waste of time. I hope your Newsjack writing is going well. Like an autistic kid counting staples, I felt I needed to get this out of my system. This is a rough breakdown of the episode of NewsJack that was broadcast on the 26th January, 2017. Breaking News was the biggest number of individual ‘jokes’, with sketches coming next and Number Crunching falling in last place. In the broadcast there was only 1 round of Number Crunching but during the recording I thought that maybe there were 2 rounds of it. Perhaps I was mistaken, its been known to happen. You can see that sketches easily take up the largest amount of time, second only to Angela with her monologue and intros to sketches. Seeing as these aren’t stuff ‘the public’ can write, I’ve not included these in the timings. When we look at the breakdown of the ‘topics’ that the one-liners and the sketches cover we can see that there was a bias to Politics and Arts & Entertainment. I’ve included the Trump stuff as ‘polictics’ so that probably squiffs the figures. 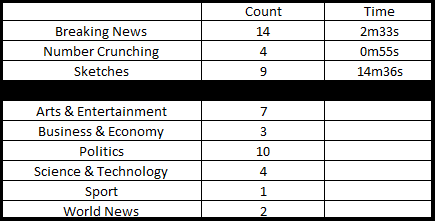 Sport/Business&Economy/World News had less than Arts&Entertainment in total. This makes me think they don’t actually try to have an even spread of jokes but choose their favourites. Nothing wrong with that but if this trend continues then it suggests there is no more chance getting a ‘sports’ joke in than a ‘politics’ one so it isn’t worth writing something in one of the less-broadcast categories. I did say I’d look at some of the jokes, especially the sketches, to see when they were ‘news’. Sketch 6 – https://en.wikipedia.org/wiki/T2_Trainspotting#Release – Released 27th of Jan but discussed all this week. Now there are 2 sketches from the 19th. Were these written that week and submitted or were they written by staff-writers who can get away with including stuff that isn’t ‘recent’? A lot happened after them so its strange that those two sketches were included. I wonder if they get lots of sketches submitted or whether they don’t get many and that’s why sometimes non-recent stuff is included. There are 3 sketches with sources from the 23rd. That gives people 24 hours tops to write their sketches. Maybe I underestimate people but with a day job, writing a funny sketch within that timeframe is impossible for me. I’ve tried it, writing a sketch on the day of submission about something that was in the news that day (to keep in current). I wonder if the other people submitting have ‘day jobs’ because if they do, they are writing some excellent comedy! You can see examples of my sketches on this blog….its not so excellent! So what have I learnt from this excerise? Was it worth it? I’m not sure. But I am glad I’ve now got this information – I just hope I don’t decide to do it for the next show. Nothing this week. There were a lot of sketches. I think I will review the broadcast and work out what categories they included jokes from. It felt ‘Trump’ heavy, which is to be expected, but if you tell people to avoid the obvious, then include the obvious, then are you ignoring people’s submissions or are you including people’s submissions who have ignored the instructions? The other thing I keep threatening to do is see when the one-lines/sketches first appeared as news stories. I think the staff writers (which newsjack use) might get stuff thats more current – especially when it comes to sketches as they will be 4 days old from broadcast and 3 days old from record… or it might just be sour grapes I can taste. Not the greatest but seeing as I attended the writer’s meeting a couple of weeks ago it seemed rude to not submit. I’d not managed to get my act together to write any scripts but I knew I could submit some one-liners. Here is what I went with. 1. Russia could be banned from next year’s Winter Paralympics. Russian competitors were up-in-arms about it until Olympic officials reminded them they were competing in a quadriplegic category. 2. Southend United sacked a groundsman after match cancelled due to frozen pitch. The English Groundsman Association have complained that this is just not cricket…where they would have received a verbal warning before being fired. 3. The Head of Britain’s Electronic Surveillance Agency has resigned. Rumours that GCHQ had been hacking into BBC Radio 4 Extra computers and altering scripts, have been strongly denied. Now I really couldn’t word the first one in a way I was happy. I tried and I tried and I tried (in the hour I had to write them before the 12 deadline on Tuesday ) but I couldn’t manage it. You will also notice there are 4 in this section but I figured 3 & 4 were actually one joke so they might let them through. One-liner number 2 was a sporting one. During the writer’s meeting they mentioned they don’t get lots of sports jokes and so I thought I would ‘play the numbers’ and see if I could write something maybe not as strong, but in a category they might not get lots in. It didn’t work out well but there it is, in all its’ glory. 1. 45th : President of the United States. 650 : Members of Parliament who actually decide if Brexit means Brexit. £35: late payment fee BT will charge itself for each payment missing in that account. All of these written in the 60 minutes before the deadline using BBC News/Mirror/Evening Standard websites as sources. NC1 – A Trump joke. There would be millions of these submitted. I thought I’d risk it for a biscuit. NC2 – She had literally just lost the case stopping her from ignoring parliamentary sovereignty. NC3 – I liked this one. Its a ‘Business’ category joke and out of all of the one-liners I submitted, I thought this would have the best chance. I’ve moved out of my usual writing style and tried something else – to ‘play the numbers’ to have stuff included. I wonder if it will work? If I really wanted to increase the possibility of something being performed, I really should do some sketches!